I was hesitated when picking up a trim on 2016 models. I need auto on/off headlights and heated seats. I definitely don't want i-eloop and don't care about other features. There are two options with different price as well. Should I spend more on Grand touring or just stay on Touring with package? Thank you for your opinion. I will be biased since I own one. I went with a 17 touring with tech package because I wanted the led headlights but didn't want to pay extra for the gt stuff. To have a gt would have been an easy 3-5k more for leather, memory seats, rims the that peel, and a subpar hud. Spoiler was nice. The led headlights are a game changer for me and I love the bose and sunroof. So instead of a 16 gt look for a 17 touring which has a more modern steering wheel, better sound insulation, and g vectoring. Price difference should be negligible. 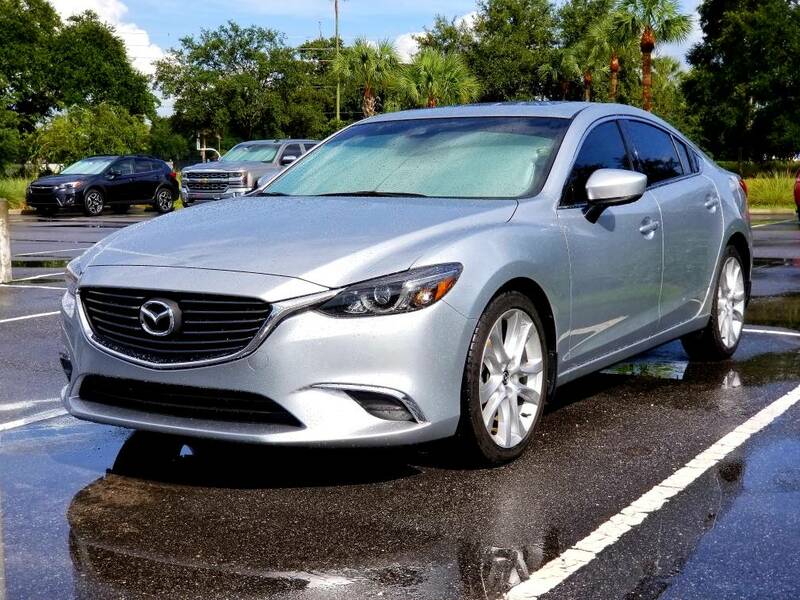 2017 Mazda 6 Touring(Premium/Bose+Sunroof Package), Sonic Silver metallic, 15% Ceramic tint, Crosstour dashcam w/hardwire kit, Android Auto Retrofit, Rubber floor mats. Thank you for sharing your experience. Your opinion helps me to keep my mind to stay with Touring trim. Do you mean 17 touring is better than 16 touring? The GT rims peel? Is the HUD different? Or do mean the 16' GT? I bought my 17' GT a few months ago with only 2000k miles and, it was a dealer car so as first real owner I got the full warranty. I got an amazing deal from an Internet dealer. I wanted used pricing, but low mileage and I do prefer leather because I wear a lot of skirts and find the other material uncomfortable. I also like the premium piping and LOVE the black headliner. Anyway, I'd heard a bit about rims pealing but thought that was earlier models, Is it an issue on the 17 GT darker color ones? Sorry was referring to the 16gt for the rims peeling. Supposedly they changed it a shade darker and fixed the issue but time will tell. There are several other threads as well. I wouldn't mind the 17gt so much since they have supposedly addressed the rims however I am not a fan of i eloop. More stuff that can break. As far as the hud goes, I believe it's called active driving display. One technology puts it on the windshield which I would prefer and the other is a plastic piece that pops out. I don't really know enough about these to make a comment as to which is better but the idea of a plastic pop out piece is. Meh.. Wouldn't stop me from buying it if it had it just would prefer one on the windshield. I believe the new 3 and 2018 cx5 have the one on the windshield. Last edited by zoomzoomz6; 03-24-2019 at 06:58 AM. 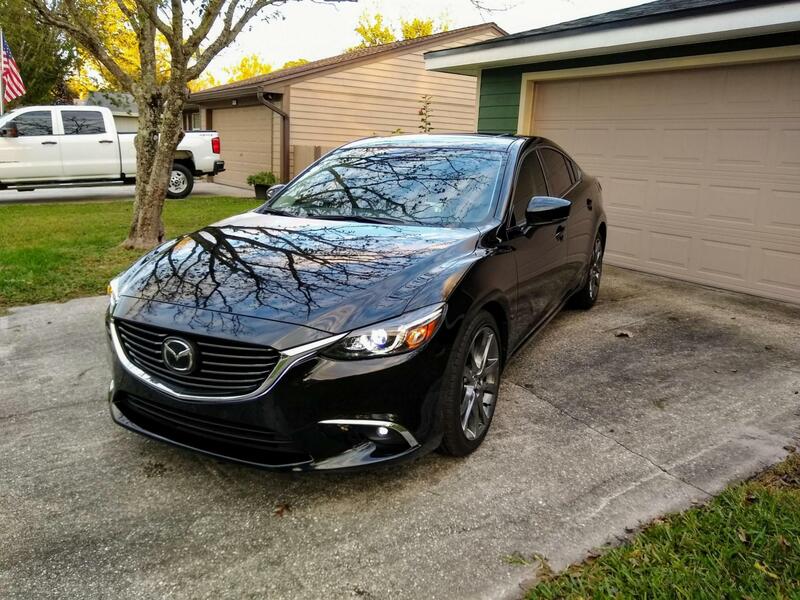 I've got the 17 gt black with gun metal rims and have no issues with peeling and no i-loop... wouldn't want it any way. I simply love this car and honestly don't even feel a need for more power (turbo). Most people are timid drivers where I live and never have a problem leading the pack... easily put down the new Honda Civic that had turbo... most of the time it is always the better driver in comparable cars that win in my experience. Every day is a joy to drive and always-always look back at my car after parking. My display is the pop up kind, I thought that was same on all the 6s. 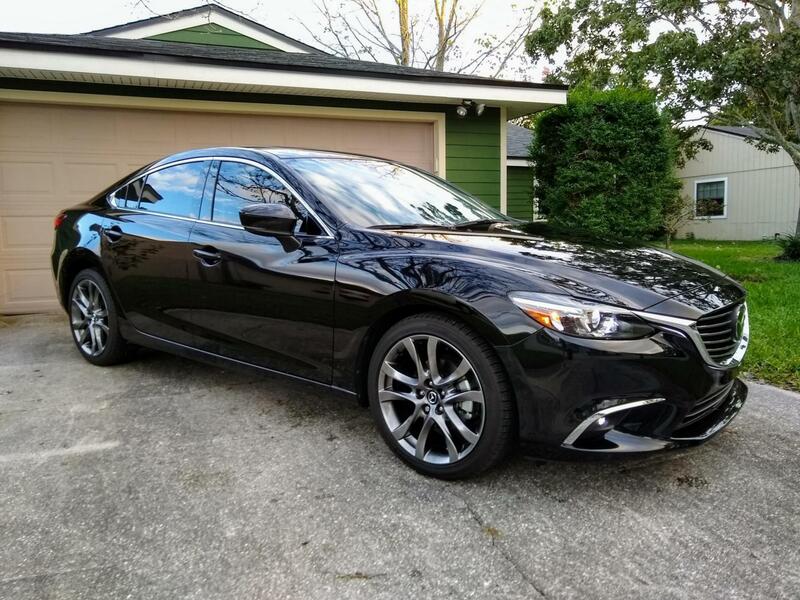 I test drove a 16' Mazda3 that had the windshield version and prefer the pop up display. It looks like glass so looks good, but I suppose it is another electronic feature than could cause issues. I had the same dilemma as you. In the end I did not feel it was worth 2-3k for real leather over leatherette, Nav, HUD (active driving display) and paddles over the touring tech package. Unless you really want real leather or the HUD you can add Nav and the paddle shifters after the fact. Nav is just an SD card (cheaper on ebay) and paddles were about $200 in parts and an hour install if you do it yourself.